Back to the Congo and the incredible Ngoma label. In fact, this week we are returning to the same important Congolese artists who appeared in my June 7, 2007 post. However, this time they are accompanied by their band San Salvador, named by Manuel D’Oliveira after his birth place in Angola. This track, an outstanding example of Congolese pop from the early 1950s, features three guitars, a beautifully captured upright bass, some subtle percussion, and not a clarinet as the label states, but a phenomenal solo on the Solovox keyboard. This is a good one. 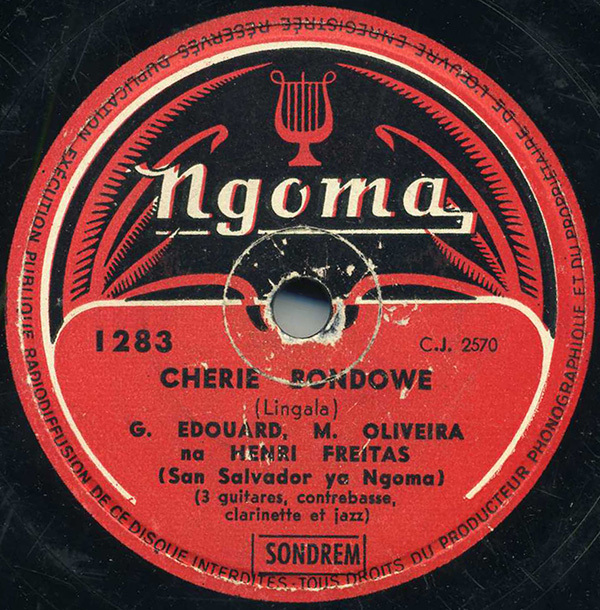 Ngoma, as mentioned in my previous post, was one of the first independent labels to start producing records out of Léopoldville (now Kinshasa), and was run by two Greek brothers: Nikos and Alexandros Jéronimidis. They recorded their first records in the late 1940s on acetates, which were then shipped to Belgium for duplication, and shipped back to Léopoldville for sale. However, Belgium proved too expensive for duplication because of import taxes, so the brothers eventually bought a tape machine for use in Congo, and a record pressing factory outside of Paris. By the late-50s, they had recorded some 2000 records, and had moved into the production of 45s. As far as I can tell, they were sold in Congo and Cameroon, with perhaps some distribution in West Africa and elsewhere (?). The original Ngoma master tapes were destroyed in a fire in 1963, and apparently the only complete collection of file copies of Ngoma releases was destroyed during internal strife in 1989. Before you African music aficionados jump up, I will admit that I’m doing something a little different here. This track originally appeared on the now out-of-print CD, Ngoma, The Early Years, 1948-1960. Although a terrific CD in its own right (with great notes by Dr. Wolfgang Bender and others), many of the tracks on that CD, including this one, were culled from less-than-perfect sources (i.e. : often muffled tape copies of original vinyl EPs, as opposed to original 78rpm copies). This song is also IN print on a Buda Musique CD titled Musique Populaire Africaine. While my copy of this record is not stone perfect, I believe this mix is a marked improvement on both the existing CD versions (give ’em a try, you’ll see) so if you are familiar with either of them, I think you will be happy. Beautiful – and a big improvement on the version on the old Pamap CD, which I love but, as you say, is a bit muffled in places. I like your display of ethics here. Beautiful track, I will be tracking down the Buda Comp. Thank you both. I was also reminded by a friend that the Buda version is in fact missing a few notes from the Farfisa introduction. Another reason to grab this one. Hi! Since it’s doubtful that Buda is compensating the artist or his family, I’m wondering why the limited downloads. I hope it’s because you’re thinking about getting a proper decent commercial release for this vanishing music. Keep the weird and wonderful music coming! It’s been my idea to not present anything that is on an in-print CD. Just my personal goal rather than an overpowering philosophy. I’ve fudged that idea once or twice (like right here), but have largely stuck to it. Most of the records here have not seen the light of day since they were originally reproduced on shellac. Buda may indeed not be paying anyone off for their use of Cherie Bondowe. Laws are slightly different in Europe surrounding those issues. However, the Jeronimidis family, for all intents and purposes the owners of the Ngoma catalog (whether it exists or not) must still be around, as they are listed as the owners of the tracks on the abovementioned “Ngoma, The Early Years” CD. Stick around! There will be something new on Sunday – hopefully to all ears.